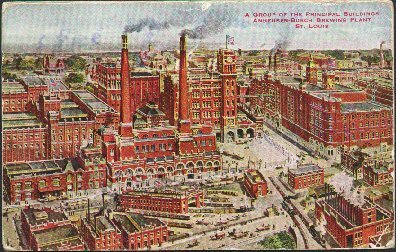 "Anheuser/Busch - Principal Buildings - Brewing Plant - Circa 1910"
(789) POSTCARD: Anheuser - Busch - Group of Principal Buildings - Brewing Plant-Condition: Very Good.- Colored Illustration - Circa 1910. Not Posted, but has addresses written on the back. Smudge mark on back left side. Price: $8.00 + shipping.